A study published in the Journal of Toxicology and Environmental Health, Part A: Current Issues by the Department of Economics and Finance at the University of New York shows how researchers suspect one or more environmental triggers are needed to develop autism, regardless of whether individuals have a genetic predisposition or not. They determined that one of those triggers might be the “battery of vaccinations that young children receive.” Researchers found a positive and statistically significant relationship between autism and vaccinations. They determined that the higher the proportion of children receiving recommended vaccinations, the higher the prevalence of autism. A 1 % increase in vaccination was associated with an additional 680 children having autism. The results suggest that vaccines may be linked to autism and encourages more in depth study before continually administering these vaccines. Study – A positive association found between autism prevalence and childhood vaccination uptake across the U.S. population. The reason for the rapid rise of autism in the United States that began in the 1990s is a mystery. Although individuals probably have a genetic predisposition to develop autism, researchers suspect that one or more environmental triggers are also needed. One of those triggers might be the battery of vaccinations that young children receive. Using regression analysis and controlling for family income and ethnicity, the relationship between the proportion of children who received the recommended vaccines by age 2 years and the prevalence of autism (AUT) or speech or language impairment (SLI) in each U.S. state from 2001 and 2007 was determined. A positive and statistically significant relationship was found: The higher the proportion of children receiving recommended vaccinations, the higher was the prevalence of AUT or SLI. A 1% increase in vaccination was associated with an additional 680 children having AUT or SLI. Neither parental behavior nor access to care affected the results, since vaccination proportions were not significantly related (statistically) to any other disability or to the number of pediatricians in a U.S. state. The results suggest that although mercury has been removed from many vaccines, other culprits may link vaccines to autism. Further study into the relationship between vaccines and autism is warranted. A study published in the Journal of Toxicology by the Department of Neurosurgery at The Methodist Neurological Institute in Houston has shown that ASD is a disorder caused by a problem in brain development. They looked at B-cells and their sensitivity levels to thimerosal, a commonly used additive in many vaccines. They determined that ASD patients have a heightened sensitivity to thimerosal which would restrict cell proliferation that is typically found after vaccination. The research shows that individuals who have this hypersensitivity to thimerosal could make them highly susceptible to toxins like thimerosal, and that individuals with a mild mitochondrial defect may be affected by thimerosal. The fact that ASD patients’ B cells exhibit hypersensitivity to thimerosal tells us something. The role of thimerosal containing vaccines in the development of autism spectrum disorder (ASD) has been an area of intense debate, as has the presence of mercury dental amalgams and fish ingestion by pregnant mothers. We studied the effects of thimerosal on cell proliferation and mitochondrial function from B-lymphocytes taken from individuals with autism, their nonautistic twins, and their nontwin siblings. Eleven families were examined and compared to matched controls. B-cells were grown with increasing levels of thimerosal, and various assays (LDH, XTT, DCFH, etc.) were performed to examine the effects on cellular proliferation and mitochondrial function. A subpopulation of eight individuals (4 ASD, 2 twins, and 2 siblings) from four of the families showed thimerosal hypersensitivity, whereas none of the control individuals displayed this response. The thimerosal concentration required to inhibit cell proliferation in these individuals was only 40% of controls. Cells hypersensitive to thimerosal also had higher levels of oxidative stress markers, protein carbonyls, and oxidant generation. This suggests certain individuals with a mild mitochondrial defect may be highly susceptible to mitochondrial specific toxins like the vaccine preservative thimerosal. A study published in the Journal of Biomedical Sciences determined that the autoimmunity to the central nervous system may play a causal role in autism. Researchers discovered that because many autistic children harbour elevated levels of measles antibodies, they should conduct a serological study of measles-mumps-rubella (MMR) and myelin basic protein (MBP) autoantibodies. They used serum samples of 125 autistic children and 92 controlled children. Their analysis showed a significant increase in the level of MMR antibodies in autistic children. The study concludes that the autistic children had an inappropriate or abnormal antibody response to MMR. The study determined that autism could be a result from an atypical measles infection that produces neurological symptoms in some children. The source of this virus could be a variant of MV, or it could be the MMR vaccine. Study – Abnormal measles-mumps-rubella antibodies and CNS autoimmunity in children with autism. Singh VK, Lin SX, Newell E, Nelson C.
Autoimmunity to the central nervous system (CNS), especially to myelin basic protein (MBP), may play a causal role in autism, a neurodevelopmental disorder. Because many autistic children harbor elevated levels of measles antibodies, we conducted a serological study of measles-mumps-rubella (MMR) and MBP autoantibodies. Using serum samples of 125 autistic children and 92 control children, antibodies were assayed by ELISA or immunoblotting methods. ELISA analysis showed a significant increase in the level of MMR antibodies in autistic children. Immunoblotting analysis revealed the presence of an unusual MMR antibody in 75 of 125 (60%) autistic sera but not in control sera. This antibody specifically detected a protein of 73-75 kD of MMR. This protein band, as analyzed with monoclonal antibodies, was immunopositive for measles hemagglutinin (HA) protein but not for measles nucleoprotein and rubella or mumps viral proteins. Thus the MMR antibody in autistic sera detected measles HA protein, which is unique to the measles subunit of the vaccine. Furthermore, over 90% of MMR antibody-positive autistic sera were also positive for MBP autoantibodies, suggesting a strong association between MMR and CNS autoimmunity in autism. Stemming from this evidence, we suggest that an inappropriate antibody response to MMR, specifically the measles component thereof, might be related to pathogenesis of autism. Woman who was a medical industry professional shares her knowledge and accounts of being bullied into taking the Vaccine, and the damaged it caused afterwards. AUSTIN (KXAN) — Joann Saathoff’s 14-year-old Pomeranian, Lexy, died on Sept. 24, and she believes the round of vaccinations Lexy received 12 days earlier led to her death. Now Saatoff is trying to raise awareness about the options owners of senior pets have when it comes to getting shots for their furry friends. It all started when Lexy went in for her annual check up. She was evaluated by the vet first, who said Lexy was in good health. Then Lexy received five shots, the same exact group of shots she’d received the year before. Within a few hours, Saathoff said her active dog had grown lethargic. “I found out there’s a lot of senior dogs out there that can’t handle the full regimen of vaccinations,” she said. She says she doesn’t blame her vet, she just wishes she knew about other options. Now she’s urging other pet owners to ask about what is best for their pets. “My message to the community is you have options with your senior level dogs,” she said. In no particular order, here are 23 highly informative, must-see vaccine documentaries that you could share with your firends. They all have to do with various factors of vaccination – evidence,, efficacy, injuries, health effects and medicinal politics. They come with a brief description pulled from YouTube. Most of them are free and featured here in-full. World Mercury Project note: With the ongoing mainstream media blackout on questions regarding vaccine safety, we want to remind our followers of the publication–and subsequent retraction–of Robert F. Kennedy, Jr.’s 2005 article “Deadly Immunity” in Salon. The history of repression of crucial vaccine safety data runs deep. The article laid out the scientific link between thimerosal and childhood neurological disorders and published explosive excerpts from the transcripts from the CDC’s secretive June 2000 Simpsonwood conference which brought together government public health officials, vaccine manufacturers and professional medical associations. The article was groundbreaking at the time and received lots of media attention for uncovering the cozy relationship between government and industry at the expense of children’s health. Even though a dozen years have passed, the article’s facts have stood the test of time. An important read for people new to the movement and long-time advocates alike. With this enormous effort in marketing vaccines and the money spent sponsoring large cohort studies showing that vaccines are always safe and effective, never expressing anything negative, and in some countries enforcing mandatory vaccine schedules wouldn’t any normal sensible person become a little suspicious and ask themselves..ARE THEY TRYING TO HIDE SOMETHING ??. It took the medical mafia 12 years to remove the evidence in Wakefield and Walker smith’s study analysis of 12 children with serious intestinal abnormalities that their parents confirmed had developed after receiving the MMR vaccine. The British media found a scapegoat using British journalist Brian Deer to uncover a potential conflict of interest to ‘blow the smoke away ‘ from the findings of the study. At the time autism was on the rise without explanation 6.2/10,000 births in 1990 to 42.5/10,000 births in 2001..for the most part the vaccine marketing machine ignored any correlation or causality toward their glorious vaccines. Why was Merck allowed to manufacture a Vaccine that included a benign children’s disease when the CDC confirmed there was no need to protect against Mumps, but the MMR vaccine was allowed anyway to be included in CDC’s vaccine schedule. My name is Tanya and on the 26th of September 2012, James my son was born 8 weeks premature weighing in at just 2.4oz. We live in a remote mining community in southern WA called Kalgoorlie and Ben, my beautiful husband, worked in the mines and because our son was born prem, he had to have a dTap vaccination and that’s just what you do. So just to be safe, as our entire family was protected and as good parents we believed we were, we always did the right thing. James ended up and is doing fine but Ben, a healthy 34-year-old loving father and beautiful husband, sadly and totally unknowingly suffered the worst fate possible. Both reported and recorded by the CDC (Centre for Disease Control) on their website, Ben had developed post vaccination ADEM (Acute Disseminated Encephalomyelitis) – our lives were shattered! By October the 11th, 2012, Ben was classified a quadriplegic and since then, his health mentally, emotionally and physically has deteriorated so bad, that our lives will never be the same again. Our vows in sickness and in health, no longer see any of the later and I’m now a full-time carer for Ben, no different than he would have done for me because our love for each other was so strong, but this curveball of life has put us to the test. We’ve lost so much and are on the brink of extinction. We’re in surmounting debt, unable to work because we have 5 children and can’t afford childcare to work and bring home anything because the growing costs to care for Ben are not met with any government support. 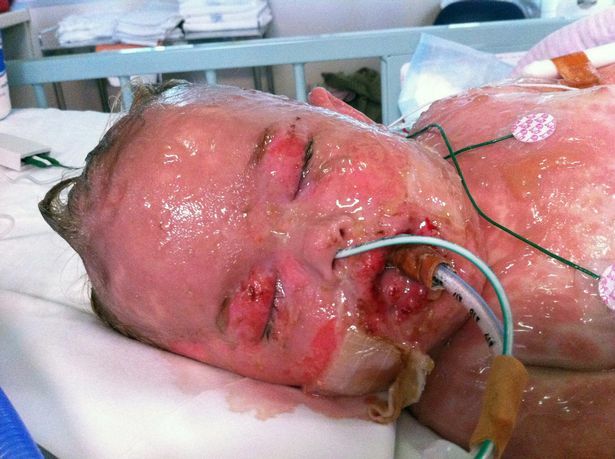 At 18 months old, Isabel Olesen of Melbourne, Australia was taken to her pediatrician’s office for routine vaccinations (the kind that almost never cause a reaction and yet, our website is FULL of children who have suffered or died from very “rare” vaccine reactions) that ended up leaving her partially blind and covered with painful blisters all over her body, just 48 hours later. It took three months of fighting for her life in the hospital, but even though Isabel lost the majority of her sight (SJS can break down the membranes around the eyes and cause them to become extremely dry) and needed to learn to walk, eat, and talk all over again- she’s now a healthy second grader who loves to ride her bike and run triathlons. Wayne Rohde, author of “The Vaccine Court”, exposing the origins of the little known court that is the only recourse to those who have been harmed by vaccines. Wayne also explains what happened with the Somali population in Minnesota and why they refused vaccines. TWO CHILDREN MURDERED VIA VACCINES IN KENYA! Entitlement Decision; Diphtheria Tetanus-acellular Pertussis (DTaP) Vaccine; Inactivated Polio Vaccine AND HUMAN SERVICES,(IPV); Haemophilus Influenzae(HiB)Vaccine; Pneumococcal Conjugate(PCV) Vaccine; Rotavirus Vaccine;Sudden Infant Death Syndrome (SIDS). Diphtheria-Tetanus-acellular Pertussis (“DTaP”), inactivated polio (“IPV”), haemophilus influenzae(“HiB”), Pneumococcal Conjugate (“PCV”), and Rotavirus vaccinations on September 2, 2011, J.B. passed away from Sudden Infant Death Syndrome (“SIDS”) on September 3, 2011. See Petition (ECF No. 1);Amended Petition(ECF No. 15).After carefully analyzing and weighing all of the evidence and testimony presented in this case in accordance with the applicable legal standards, the undersigned finds that petitioners have met their legal burden. Petitioners have put forth preponderant evidence that the vaccines J.B. received on September 2, 2011 actually caused or substantially contributed to his deathfrom Sudden Infant Death Syndrome. Furthermore, respondent has failed to put forth preponderant evidence that J.B.’s death was in fact caused by factors unrelated to the vaccines. Accordingly, petitioners are entitled to compensation. RESULTS: All three patients developed secondary amenorrhea following HPV vaccinations, which did not resolve upon treatment with hormone replacement therapies. In all three cases sexual development was normal and genetic screen revealed no pertinent abnormalities (i.e., Turner’s syndrome, Fragile X test were all negative). Serological evaluations showed low levels of estradiol and increased FSH and LH and in two cases, specific auto-antibodies were detected (antiovarian and anti thyroid), suggesting that the HPV vaccine triggered an autoimmune response. Pelvic ultrasound did not reveal any abnormalities in any of the three cases. All three patients experienced a range of common non-specific post-vaccine symptoms including nausea, headache, sleep disturbances, arthralgia and a range of cognitive and psychiatric disturbances. According to these clinical features, a diagnosis of primary ovarian failure (POF) was determined which also fulfilled the required criteria for the ASIA syndrome. CONCLUSION: We documented here the evidence of the potential of the HPV vaccine to trigger a life-disabling autoimmune condition. The increasing number of similar reports of post HPV vaccine-linked autoimmunity and the uncertainty of long-term clinical benefits of HPV vaccination are a matter of public health that warrants further rigorous inquiry. Weston and Emily are vaccine injured. Weston received 20+ vaccines in 4 months before he was 6 months old. He is now 19 and functions at the level of a 3 year old. Emily is 17 and functions at the level of an 8 year old. Both will require a lifetime of care and support. AutismOne Media – Dr Arthur Krigsman -Autism Associated Enterocolitis. Does my child have it? What Can I Do About It? Dr. Arthur Krigsman presents an up-to-the minute report on what has been learned about determining a child’s gastrointestinal health status via innovative and objective laboratory testing, with corresponding information about helpful steps to take should test results evidence pathology and/or dysfunction. Gastrointestinal symptoms are exceedingly common in children with autism and are known to be associated with the severity of ASD behaviors. Parents and caregivers often underestimate or fail to recognize GI symptoms because of the focus on behaviors, cognition, and speech. However, recognition, evaluation, and treatment of GI symptoms, particularly autism-associated enterocolitis, often improves not only the child’s GI symptoms, but also cognition and behavior as well. This lecture uses photographs and videos of affected children (facial features removed) to demonstrate GI symptoms in this poorly communicative patient group as well as demonstrating actual images of ASD-associated GI inflammatory pathology obtained at endoscopy and biopsy. The unique features of ASD-associated enterocolitis that together comprise a new disease entity will be presented. Proposed therapeutic interventions will be discussed.